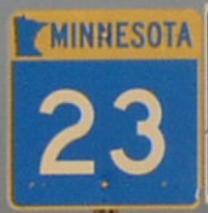 Minnesota State Route 23 is a north-south highway across Minnesota. This runs in a angle from the southwest corner of the state to the northeast corner. This is a mian surface connection between the Duluth Area and the Sioux Falls, South Dakota Area, via Interstate 90. Info on MN St Rt 23 is broken down by county below.